03/2008: The Borough of Bernardsville has purchased the James Dunster Homestead property using open space funds. A friends group has been formed to advocate and find funding for restoring and rehabilitating the house. 10/2010: Bernardsville Borough has secured a $76,000 grant from Somerset County for restoration work at the James Dunster Homestead. Planned work includes gutter repair, a new roof, new windows, and new siding. Revolutionary war veteran, James Dunster, grandson of an original East Jersey Proprietor, built this home in 1805. His son Oliver lived in it until 1891. In 1899, the Dunster Homestead Farm house was purchased by Charles F. Squibb, son of E.R. Squibb who founded the pharmaceutical company of the same name and is still owned by a member of the Squibb family. At the time of purchase, the house was rented to Curtis O. Dunster for three hundred and sixty dollars a year plus one-fifth of the apples raised there. Over the last century, pieces of the one hundred and twenty-acre farm have been sold off, and there now exists slightly less than four acres of land divided into two lots. In addition to the main house, there is another structure up the hill, a connected house, and barn that originally served as the coachman’s cottage. The main house has been unoccupied since the fall of 2004, but much of the house’s core structure and end chimneys are in decent condition. An insensitive addition is reversible. The interior hand-hewn pegged attic beams and five fireplaces are intact. The stone wall is in good condition, but the smoke house needs repair. The house is currently on the market, and the owner hopes it will be sold to an individual or organization interested in preserving it. 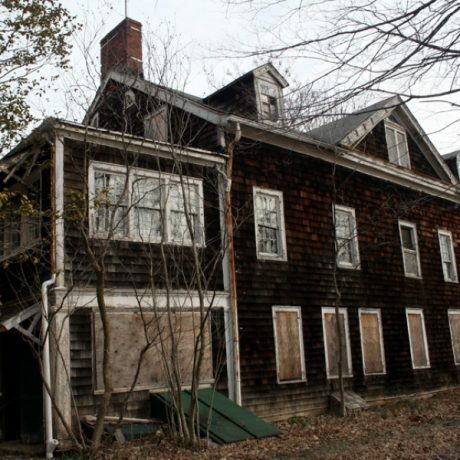 The Borough of Bernardsville is aware of the Dunster Homestead’s historical significance, and the local historic preservation advisory committee believes the building could be rehabilitated. PNJ concurs. Passage of the New Jersey Historic Rehabilitation Tax Credit would be one way to provide an incentive to a potential buyer who might save this valuable link between past and present. The owner is looking for a preservation minded buyer who will rehabilitate and preserve the homestead.